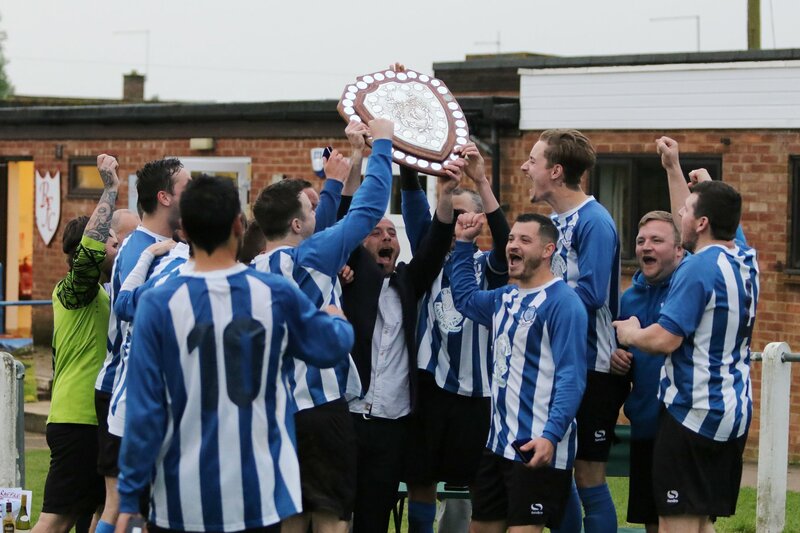 Buckingham Firsts hosted Padbury Village in the teams' return league fixture and, having beaten them convincingly 4-1 at their last meeting, were aiming to take another three points from a team lower than themselves in the league table. Buckingham started the match with their preferred formation of 4-2-3-1 that has served them well and seems to suit the team's style of play. The match started slowly with neither team testing the other, however, Jack White and Bobby Cooney's presence, made it clear, from the off, they would win the battle in midfield. Padbury Village though were first on the score sheet. A ball pinged from the left winger found the back post and the forward needed only a touch to calmly finish to the bottom corner. This first goal seemed to kick the game into life and both teams began to attack. A flurry of set pieces and corners resulted in a goal, when a corner, whipped in by Bobby Cooney, found Danny McCarthy to chest it in from 5 yards. Padbury didn't seem to present much of a goal threat but their winger, finding himself on the corner of the 18 yard box, turned and drilled a shot that pinged off the post and went in. With the score now at 2-1 in Padbury's favour, the Buckingham team pushed for the equalizer but, with only 7 minutes left in the half, were unable to find the net. Manager Dean O'Connor delivered some stern words to the team at half time and needed a reaction from the players in the second. Buckingham, whilst still in the game, were playing well below their potential but the manger's fiery half time talk seemed to have worked as the team sparked into life. Buckingham players began to win their individual battles resulting in the team dominating the park. Bobby Cooney picked up the ball wide on the left, linking up with Ashley Urquhart, then floated in a cross back post to find Mitchell Young who headed it home to make it 2-2. Buckingham continued to push on and win the ball back in Padbury's half and Danny Charlesworth, beginning to hold some influence on the game, came up with a moment of brilliance. Picking up the ball on the half way line, after a dummy from Jack White, Charlesworth pushed the ball passed one player and, spotting the keeper off his line, scored from a lob 35 yards out. A fantastic goal and another contender for goal of the season. This goal put Buckingham 3-1 up and in control of the game. Padbury Village were showing little to get themselves back into the match, Buckingham pushed on and were on the score sheet again five minutes later. Danny Charlesworth put in a ball from the right for Mitchell Young to fire in a volley, the deflection landed to Ashley Urquhart, who controlled it with his back to goal five yards out, and with a cheeky back heal put it in the net. 4-1 up and Buckingham were looking comfortable. A rare Padbury attack resulted in a dubious goal. An attempted clearance by a Buckingham player, hit the hand of the Padbury attacker but hand ball wasn't given. The ball fell perfectly to the forward and with a clear run in on goal he finished in the corner. A poor goal to concede and with the scoreline now at 4-3 Padbury were back in the game with 15 minutes remaining. Harry White came out and collected a hopeful through ball and using the wind, his kick cleared the Padbury defence, and after one bounce Mitchell Young, with his back to goal, flicked the ball with the outside of his foot and lobbed the keeper. A fantastic goal which won the game for Buckingham with Mitchell Young, the top goal scorer, demonstrating every week his importance to the team. Bobby Cooney picked up 3 assists and had an outstanding match. This was matched by Jack White, who may not have scored or assisted anyone, but his influence and presence throughout the game deservedly won him Man of the Match. A great 3 points for the Buckingham Firsts, they now sit 4th in the league and next play Southcott Village Res, another match they will be looking to win.